One of my favorite ways to eat eggplant during the summer months is to grill and marinate them with a simple sauce of olive oil, vinegar, garlic and fresh mint, a minty vinaigrette. These are so good and easy to make that you will make them all the time, just as I do. Please read last year post on how to buy eggplants. For this recipe I tend to use the globe eggplant sliced crosswise but I also use the Italian eggplant sliced lengthwise. Whatever type you use, be sure to cook the eggplant until it is tender all the way through. Prepare the marinade in a baking dish while you heat the grill. Mix the olive oil, red wine vinegar, minced garlic, chopped mint, salt and pepper in a baking dish. If your vinegar is too strong you can add a teaspoon or two of balsamic vinegar to cut down on the acidity of the vinegar. 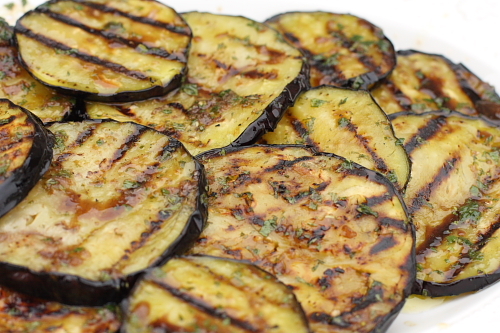 Set the marinade aside while you prepare and grill the eggplant. Season both sides of the eggplant with salt and brush generously with olive oil. 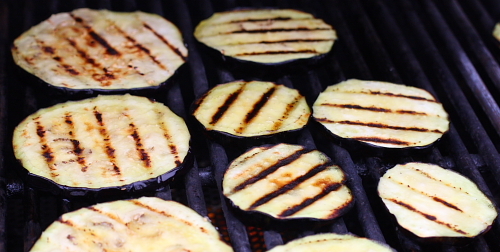 Grill the eggplant until fully cooked on both sides. Don't be afraid to brush them with additional oil while you grill them. If you don't have a grill, you can use a grill pan. When the eggplant slices are done, transfer them to the baking dish with the marinade. Turn them to coat generously with the marinade. Transfer the eggplant to a platter. Spoon any unabsorbed marinade over the eggplant. 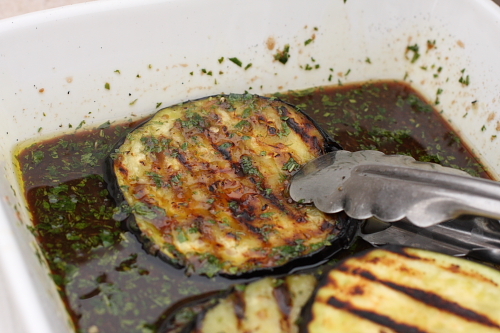 This dish is best served when the grilled eggplant has had a few hours to soak up the marinade. If possible, prepare it 3 to 4 hours before serving and keep at room temperature. Serve with crusty bread for soaking up the juices. I always grill more than one eggplant, since they are as good or better in a sandwich the next day. They also keep well in the refrigerator for few days. Just remember to bring them to room temperature. Prepare the marinade: Put the first six ingredients in a 2- to 3-quart (2- to 3-liter) baking dish and whisk with a fork to blend. Taste and adjust the seasoning. Prepare a moderate charcoal fire or preheat a gas grill. You can also cook the eggplant over moderate heat in a ridged grill pan on the stove. Remove the eggplant stem, then cut the eggplant crosswise into 1/2-inch-thick (12-millimeter-thick) rounds. You should have about 12 slices. Using the 1 teaspoon salt, season both sides of each slice. Brush both sides generously with the olive oil, reserving any excess oil for grilling. Grill the eggplant without turning until it is nicely colored on the bottom, 3 to 5 minutes, then brush the top surface with olive oil and turn. (You may not need all the oil.) Grill the second side until the eggplant is cooked through but still holds its shape, another 3 to 5 minutes. As the eggplant slices are done, transfer them to the baking dish. Turn them to coat them generously with the marinade. As necessary, overlap the eggplant in the dish, spooning marinade over each slice. Transfer the slices to a serving platter and spoon any unabsorbed marinade over them. Serves 4 to 6 Copyright 2004, Rosetta Costantino. All rights reserved.